Use this guide for advice on locating records at The National Archives of emigration and of individual emigrants from Britain. Of the millions of people who have emigrated from Britain over the last four hundred years, the largest number have gone to the USA, Canada, Australia, New Zealand and South Africa. Records of British migrants to these countries form the primary focus for this guide. The guide provides an overview of the records, but is not a comprehensive list of all sources. Some records are available online but many are not. To make use of the records covered in sections 5 to 11 you will need to visit us or pay for copies to be sent to you. To request copies you will need to identify document references and this will not be possible in some cases without first consulting printed and published resources available at our building in Kew. You may also be interested in our webinar on emigration. Our records are the records sent to us for permanent preservation by the central government of the United Kingdom. Most of the records related to emigration are policy and administrative documents, rather than records of emigrants themselves. As we hold relatively few records of people leaving Britain, you are more likely to find records of migrants in their destination country (see section 3). There are, nonetheless, large numbers of records in our collection in which you can identify individual emigrants, but there is no single index for them so tracking them down means looking in a variety of different record series. The records of emigrants divide into two broad types: records of the journeys that emigrants made and of their lives once settled overseas. Records of British emigrants once they were settled abroad were much more likely to have been kept if they moved to a British colony. The bulk of the records we hold for British emigration were originally kept by the government departments concerned with life in the colonies. Of course, emigrants from the UK become immigrants in the countries they travel to. In general, you are more likely to find a record of a person, after they emigrate, in the destination country. An advertisement from 1889 for the White Star Line (catalogue reference COPY 1/930). White Star Line ships transported tens of thousands of British emigrants to Canada and the United States in the late 19th and early 20th centuries. Buy a high-quality reproduction of this image through our Image Library. Most of our online records in this subject area are documents listing individual emigrants. If you cannot find who you are looking for in the records described in this section, your search is likely to become very much more complicated and will probably require consultation of original documents at The National Archives in Kew (see sections 5 to 11). 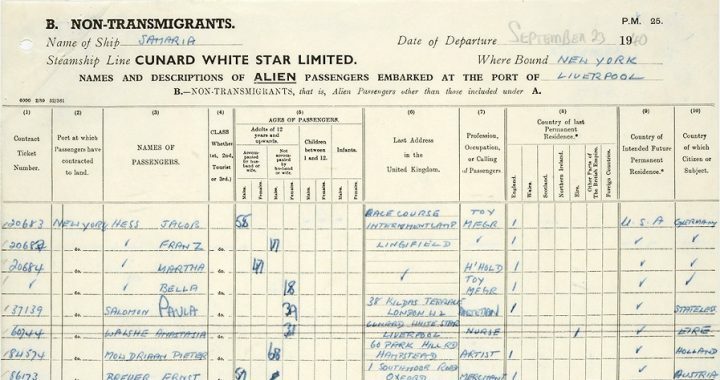 Search outward passenger lists on findmypast.co.uk (£) for lists of passengers leaving by ship from UK and Irish ports and travelling to places outside Europe and the Mediterranean Sea, including the USA, Canada, India, New Zealand and Australia. The lists include citizens of other countries who travelled through the UK on their way to other destinations. Lists were not kept for every ship and some have been lost. A cross section of a passenger list from 23 September 1940 for the RMS Samaria, bound for New York from Liverpool (catalogue reference BT 27/1557). This list shows passengers who were not British nationals. Search the Registers Of Licences To Pass Beyond The Seas 1573-1677 (E 157) on findmypast.co.uk (£) for records of soldiers leaving for the Low Countries (1613-1633), individuals travelling to Europe (1573-1677) and to Barbados, New England and other colonies (1634-1639 and 1677). Search for details of emigrants from England, and later Britain, who settled in Barbados on findmypast.co.uk (£) within Colonial Office papers and correspondence (CO 1/44 and CO 28/16), which include a census of the white population in Barbados from 1715. The Immigrant Ancestors Project – sponsored by the Center for Family History and Genealogy at Brigham Young University – uses emigration records, including sources at The National Archives, to locate information about the birthplaces of immigrants in their native countries. Volunteers working with scholars and researchers at Brigham Young University are creating a database of millions of immigrants based on these emigration sources. Passenger lists are among the most accessible and straightforward of records documenting emigrant journeys. Our guide on records of passengers contains more information. This is our more comprehensive set of passenger lists. They are held in record series BT 27 and are described in more detail in the ‘Online records’ section. Registers of passenger lists were arranged by port and kept by the Board of Trade. Before 1908 the registers relate only to the ports of Southampton, Bristol and Weymouth. They provide the names of ships and the month of arrival and departure. After 1920 the precise date of arrival or departure is recorded. The lists are held in record series BT 32. You can select documents by year range from this list of all BT 32 references. We hold passenger lists of HM steam packets carrying passengers to, from and within the Mediterranean area between 1831 to 1834. 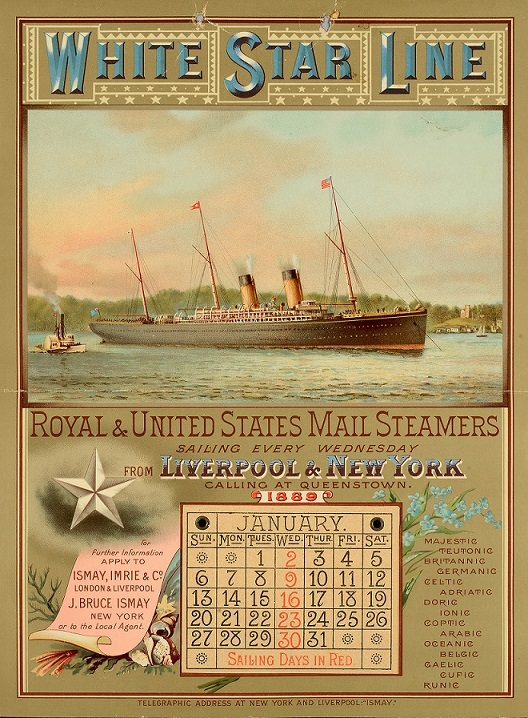 Steam packets were steamships that departed from a port on a regular schedule. The lists are in ADM 30/35. This section covers records and record series specific to emigration to North America. For more general advice on colonial era documents for this region see our guide to records of American and West Indian colonies before 1782. John C Hotten compiled Original lists of persons who went from great Britain to the American plantations 1600-1700 (London 1874) based on Colonial Office records, as well as the Registers of Licences to Pass beyond the Seas kept by the Exchequer (series E 157) for passengers requiring licences to travel to New England, Barbados, Maryland, Virginia and other colonies 1634-1639 and 1677. See the ‘Online records’ section of this guide for advice on how to view the registers in series E 157. The Hudson’s Bay Company was founded in 1670. Its chief interests were originally the fur trade, exploration and settlement. After 1870, when its territory of Rupert’s Land was incorporated into the Dominion of Canada, its interests became more varied. The Hudson’s Bay Company archives, covering 1667-1991, are held on microfilm at The National Archives in record series BH 1. The original Hudson Bay Company archives are held at the Archives of Manitoba, Canada. The records include names and information about settlers who emigrated to North America and worked for the company. The West New Jersey Society records in TS 12, covering 1675 to 1921, relate to tracts of land in West and East New Jersey, Pennsylvania, New England and elsewhere, divided up as shares of the company. The records contain many names in the original correspondence, minute books, registers of shares, original deeds, and papers about claims. David Dobson’s Directory of Scottish settlers in North America 1625-1825 (Baltimore, 1984) draws on records in the Audit Office accounts (AO 3), Prince Edward Island original correspondence (CO 226/23), Home Office correspondence and papers, Scotland (HO 102) and the Treasury registers (T 47). Search for records of the American Loyalist Claims Commission in T 79. There is an index to these records printed in Lists of the Records of the Treasury, the Paymaster General’s Office, the Exchequer and Audit Department and the Board of Trade to 1837 (Public Record Office Lists and Indexes No XLVI; London 1922) pp.105-110. A similar list of East Florida claims for compensation for territory ceded in 1783 to Spain is in the same volume, pp.95-97. Bernard Bailyn’s Voyagers to the West: Emigration from Britain to America on the Eve of the Revolution (I B Tauris, 1986), utilizes the registers kept by port customs officials of emigrants leaving for the New World – these register are held in T 47/9-12 and are available to view on Findmypast.co.uk (£) – see section 4.2. They give a person’s name, age, occupation, reason for leaving the country, last place of residence, date of departure and destination. Treasury correspondence and registers show that the department handled a considerable amount of colonial business, and contain references to British people in the colonies or planning to emigrate, with many references to North America. See our guide to Treasury Board letters and papers 1557-1920 for more information about how to search for Treasury records. For information about passport registers and indexes in FO 610 and FO 611, see our guide to passport records. See our guide on Criminal transportation for information about the records available on convicts transported to Australia. Many of the record series referred to in this section refer to both convicts and settlers since, once in Australia, the two were often less distinct than when they set out. The National Archives holds no lists of passengers who sailed to Australia as ordinary emigrants until 1890. 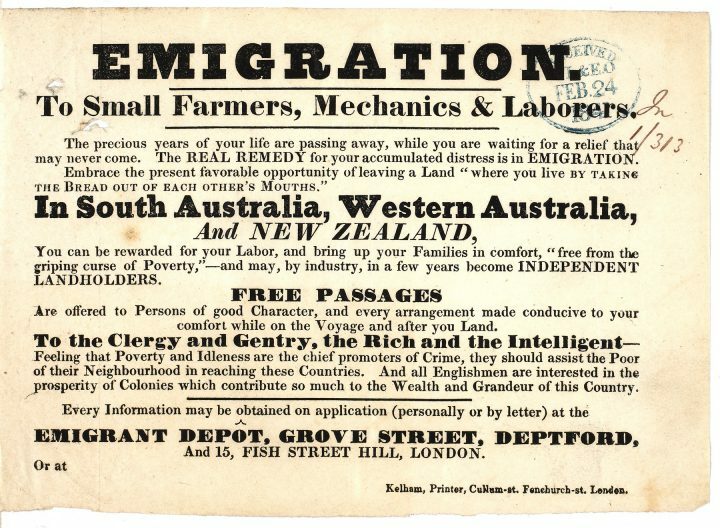 The website of The National Archives of Australia has more information about emigration to Australia. In addition, details of some 8.9 million free settlers to New South Wales, 1826-1922 can be searched and downloaded online at Ancestry.com.au (£). This notice dates from 1841 (catalogue reference CO 384/66). It was issued after the Poor Law Amendment Act of 1834 which stipulated that provision could be made for the emigration of the poor, with the cost being borne by the pauper’s home parish (see section 9). The first European settlement of New Zealand was around 1820. The New Zealand Company was formed in 1839 and incorporated in 1841 with power to buy, sell, settle and cultivate land in New Zealand, and details of British emigrants can be found in the company’s records, now held at The National Archives. It surrendered its charter in 1850 and was dissolved in 1858. For further information see the Archives New Zealand website. We hold records of the Poor Law Commission and related bodies. These records include material about pauper emigration under the terms of the Poor Law Amendment Act of 1834. The act stipulated that provision could be made for the emigration of the poor, with the cost being borne by the pauper’s home parish. Search Poor Law Union papers 1834-1900 in MH 12 using keywords like ‘emigration’, ‘emigrant’ or ‘emigrate’. Try adding words and phrases such as ‘lists of persons’, ‘children’ ‘Australia’, ‘New Zealand’, ‘Canada’ or ‘Quebec’. These records include lists of paupers who were ‘seeking to emigrate’ as well as those of paupers who had already emigrated to the colonies. Use the registers of correspondence in MH 20 to locate items of correspondence in MH 19. The registers, as with the correspondence itself, are arranged by government department so to have an idea of where to look for records of emigration you will need to determine which departments the Poor Law Commission would be corresponding with on that subject – the departments listed in section 2 would be a good start. Child emigration schemes operated in Britain from 1618 to 1967. About 150,000 children were sent to the British colonies and dominions during this time, with numbers peaking between the 1870s and 1914 when approximately 80,000 children were sent to Canada alone. Many of them were pauper children, often in the care of voluntary organisations (in the mid-18th century around one in three of all paupers was under 16). The enormous strain on poor law authorities meant they could not find apprenticeships for all pauper children. The Poor Law Amendment Act 1850 provided a response, allowing Boards of Guardians to send children under 16 overseas for the first time. The majority of schemes began in 1870. Frequently it was the voluntary organisations that arranged for the child’s migration. They were sent mainly to North America and Australia, but also Zimbabwe (Rhodesia), New Zealand, South Africa and the Caribbean. An exhibition and website on child migration called On their own – Britain’s child migrants has been developed by the Merseyside Maritime Museum and the Australian National Maritime Museum. 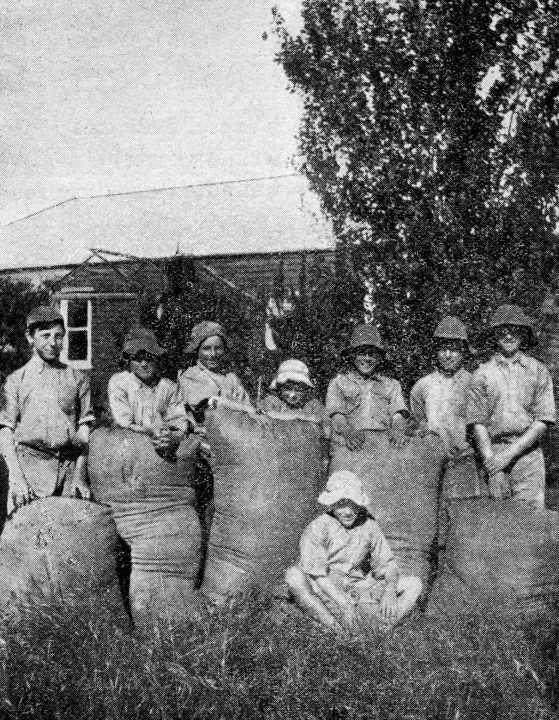 Migrant children at a Fairbridge Society Farm School in Western Australia some time in the early 20th century (catalogue reference MH 102/1400). The children were sent to Australia on the Fairbridge Society Emigration Scheme. We hold few emigration records for child paupers and those that we do hold tend to record only statistical information on the numbers of children sent overseas, though they sometimes include poor law union posters giving notice of the names and ages of children being sent abroad. See section 9 for advice on how to search for records of pauper emigrants, including children, in general. Among the most detailed records we hold of this kind are the reports on pauper child emigrants resident in Canada, 1887 to 1892, held in MH 19/9. The reports comment on the children’s condition, health, character, schooling, frequency of church attendance, and each child’s view of their new homes. They cite the Poor Law Union or parish from which they were sent, as well as each child’s name, age and host’s name and address. Registers and case files of child emigrants (subject to 100-year closure periods from the date of birth) within the records relating to Maria Rye and Annie Macpherson, who both championed child emigration, and to the work of Dr Barnardo’s, held by the University of Liverpool’s Department of Special Collections and Archives. Photographs of former Barnardo’s residents in Barnardo’s Photographic and Film Archive. Canadian government inspectors’ reports and statistical information regarding child migrants in Parliamentary Papers (institutional subscription required). In May 1940 the growing threat to the UK from both invasion and mass air attack led to offers of hospitality for British children from Australia, New Zealand, South Africa, Canada and the USA. About 11,000 children were evacuated overseas via private schemes before, on 7 June 1940, the creation of the Children’s Overseas Reception Board (CORB). A total of 3,100 children were sent to Australia, Canada, New Zealand and South Africa under the CORB scheme between July and September 1940. Evacuation stopped on 17 September 1940 when SS City of Benares was torpedoed with the loss of 77 Canada-bound children on board. All future CORB sailings were cancelled, but the Board remained active until its disbandment four years later. Many CORB children returned to the UK after the hostilities to be reunited with their families. Search our catalogue using the search box below by name for case histories of the CORB children evacuated overseas during the Second World War (DO 131). Dominions Office policy files relating to the activities of the Board are in DO 35. Contemporary newspapers in the destination countries provide accounts and photographs, especially of the arrival of evacuees in the summer of 1940. Additional records about child migrants may be held in the archives of the recipient countries (see section 3). Before 1972 the Home Office was responsible for putting into effect various Acts relating to children. Search the broader Home Office policy files in MH 102 for policy documents on child emigration. Most of these records relate to schemes between 1910 and 1960 set up by the UK, South Africa, Canada, New Zealand and Australia. They include initiatives by Dr Barnardo’s Homes, the Fairbridge Society, the Overseas Migration Board, and the Big Brother Movement. Some files are closed for 75 or 100 years but can be requested under the Freedom of Information Act. Search for earlier records in Home Office registered papers in HO 45 and HO 144 using keyword phrases such as ‘children AND emigration’. The relevant documents are mainly policy and correspondence files relating to the emigration of children under the Children Act 1908. They include information about schemes for the emigration of children to Canada and Australia. The work of the larger departments of central government inevitably involved issues of emigration from time to time. It is therefore worth searching among the records of some departments not primarily concerned with emigration. However, searching among these records will be speculative and time-consuming. The tentacles of the Treasury reach into the work of almost every other government department at some stage, so you can find almost every subject covered in its records. Much colonial business was handled by the Treasury and its records contain references to people in or travelling to the colonies. The records of the Privy Council, an advisory body to the monarch, cover numerous matters relating to the colonies. The Court of Chancery presided over hundreds of thousands of civil dispute cases from the late 14th century onwards. For more in-depth advice on how to locate Chancery records read our guides to Chancery equity suits after 1558 and before 1558. The records of Chancery pleadings in series C 2 to C 11 (1558-1758) can include disputes with people living in or trading in America and the West Indies. Search each series by name of plaintiff. Chancery Masters Exhibits c.1250-1859 in C 103-C 114 include material relating to grants of lands and sometimes wills. Look at the Ship’s List website for information about passenger lists to Canada, USA, Australia and even some for South Africa, as well as immigration reports and newspaper records. Find information about British emigrants to Argentina and Uruguay in the 19th and 20th century at argbrit.org. Find information about child migrants sent from Britain to Canada, Australia and other Commonwealth countries from the 1860s to the 1960s using the On Their Own website.